MALAYBALAY CITY (IPS) Eight infrastructure projects with a total of P206.3 million are expected to be completed within this year in Bukidnon State University (BukSU), according to a report from the Office of the Chief Administrative Officer. State universities and colleges are able to fund capital outlay in infrastructure based on two funding sources, Fund 101 or national government subsidy through the General Appropriations Act (GAA) and Fund 164 or the institution’s special trust fund from its own sources, said Ms. Wilma Gregory, BukSU Chief Administrative Officer- Finance. Dr. Oscar B. Cabañelez, university president, said if funds are available he is committed to build more infrastructures under his administration to cater to the growing needs of the academic community. He added that delivery of education and support services will be enhanced with appropriate learning space for the students, the faculty and the non-teaching personnel. Student Regent Dante Damit told the IPS the new infrastructure projects embody the universityʾs commitment to produce quality graduate. ʺThe new academic and support services buildings means better and more conducive learning space for students. We are happy to know the university is totally committed to the welfare of students and their learning experience,ʺ Damit said. Dr. Ma. Theresa Salumintao, chairperson of the Business Administration department of the College of Business. Said additional learning spaces amazed and inspired her students. She said previous graduates took notice of the makeover in BukSU infrastructure in recent years. ʺThis has been object of benchmarking by our visitors. They are not only interested in our programs and processes. They are also interested in our physical environment,ʺ she said in an interview. Of the P206.3 million, the university sourced a total of P161.9 million from the national government and a total of P44.46 million from its own special trust fund. The projects funded under the GAA are the following: Construction of four-storey College of Arts and Sciences academic building with laboratories and classrooms (Phase 1) worth P29.9 million; construction of four-storey College of Education academic building Phase 1 in the Annex Campus worth P49.9 million; construction of three –storey Rubia Ladies Dormitory worth P48.75 million; construction of four-storey Finance Management Building Phase 2 and the construction of the perimeter fence Phase 2 (Annex Campus) worth P9.94 million. The projects funded under the special trust fund of the university include the construction of four-storey health services building with basement and roof deck (Phase 1) worth P29.9 million; the Supply and Installation of Elevator for Research and Graduate School Buildings worth P9.9 million and the construction of two-storey automotive shop with classrooms worth P4.5 million. Engr. 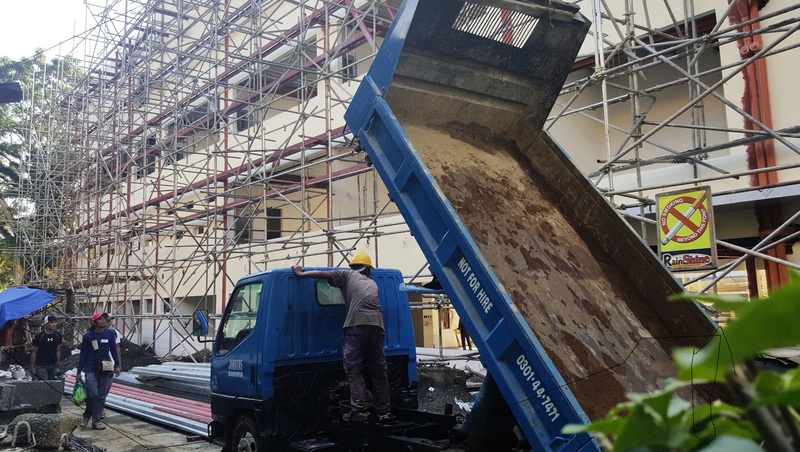 Weldedito Quilang of the Chief Administrative Office, said as of date the automotive shop, the perimeter fence Phase 2, the Finance Management Building Phase 2 ad the Ladies Dormitory were already completed on target date. The construction of the Health Services Building might be extended up to January 2019. Two other construction projects already approved by the Board of Regents for awarding have already started but are due to be completed in 2019, citing the Phase 3 of the Finance Management Building worth P30 million and Road network and drainage system in the Annex Campus worth P12.8 million . Engr. Quilang added additional five projects worth P16 million in estimates are also proposed for approval by the BOR for award, such as the P5-million mini-oval with ground landscaping in BukSU main campus Valley, renovation of Fourth Floor of the University Library, Repair of the College of Nursing Building, Renovation of the First Floor College of Education Building, upgrading of the Quality Assurance Office and Graduate Library and replacement of roofing and ceiling of Old CAS Building. Additional nine other construction projects worth P155 million in estimates will be proposed for approval of authority to procure before the BOR, Engr. Quilang said. In this set of projects, the biggest chunk, P100 million, will go to the Phase 2 of the College of Education building in the Annex Campus in Casisang, a project initiated in the administration of Dr. Cabanelez mindful of the growing space needs of the university. Also included in this set of projects is the construction of a five-storey training laboratory and equipment for Hotel and Restaurant Management Phase 1 in BukSU Hotel worth P18 million in estimates. Mr. Dante S. Victoria Jr, Vice President for Administration, Planning and Development, said all infrastructure projects were in consonance to the BukSU Main Campus Development Plan of 2015 and the BukSU Casisang Annex Campus Development Plan of 2017, which are prepared by the OVPAPD.